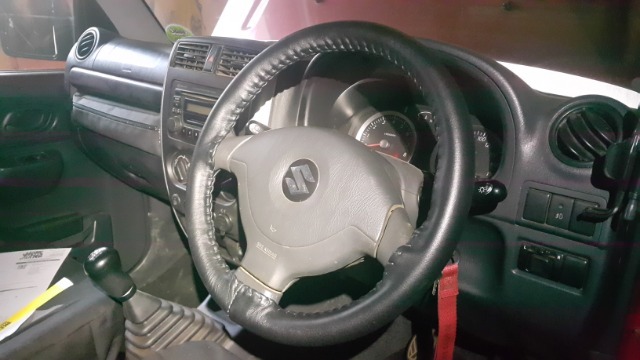 Anyone have a jimny leather steering wheel for sale? OlaGB wrote: Anyone have a jimny leather steering wheel for sale? I bought a cover from wheelskins.com/ A little effort to fit, but I was very happy with the results. Last edit: 11 Feb 2019 21:03 by saxj. Seen them on ebay, but naah.. OEM leather wheel is the only way to go for me.. But thanks for the input anyway! Be aware that the leather steering wheel is not that durable if you work with your hands for a living. I have skin like sandpaper and the leather didn't last 6 months before showing signs of serious wear. I have a parachute cord wrap on it now and even it is getting tired now but it's lasted about 5 years. Lambert wrote: Be aware that the leather steering wheel is not that durable if you work with your hands for a living. I have skin like sandpaper and the leather didn't last 6 months before showing signs of serious wear. I have a parachute cord wrap on it now and even it is getting tired now but it's lasted about 5 years. Thanks for the info Lambert! Seems weaker than most then.. I dont have that rough skin, so i dont think it`ll be a big problem for me, but that info sure will make me looking for wear before buying!